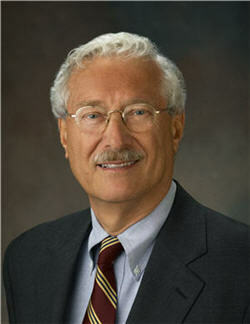 A leading authority in the field of disaster management will give the 2012 Joseph Leiter NLM/MLA Lecture. Dr. Frederick M. “Skip” Burkle, Jr. will discuss “Future Humanitarian Crises: Challenges to Practice, Policy and Public Health,” on May 9 at 2 p.m. in the Lister Hill Center Auditorium in Building 38A at the National Library of Medicine. The lecture will be broadcast live and later archived at http://videocast.nih.gov. Dr. Burkle is Senior Fellow and Scientist at the Harvard Humanitarian Institute at the Harvard School of Public Health. He is former Senior Scholar and now Senior Associate Faculty and Research Scientist at the Center for Refugee & Disaster Response at Johns Hopkins University Medical Institutes. He also serves as Senior International Public Policy Scholar at the Woodrow Wilson Center for International Scholars in Washington, DC. Dr. Burkle is a retired Captain in the US Naval Reserve who completed combat tours in the Vietnam and Persian Gulf Wars and with the US Central Command in Somalia. The Harvard Humanitarian Institute Web site has a more detailed biography of Dr. Burkle. The Joseph Leiter NLM/MLA Lecture was established in 1983 to stimulate intellectual liaison between the National Library of Medicine and the Medical Library Association. Dr. Leiter was a researcher at the National Cancer Institute and served as NLM Associate Director for Library Operations from 1965-1983. May 4, 2012 in Events.